Because Negra's exact birthdate is unknown, we choose to celebrate her "rebirth" each year on the date that she finally found the safety, comfort, and love of her sanctuary home. 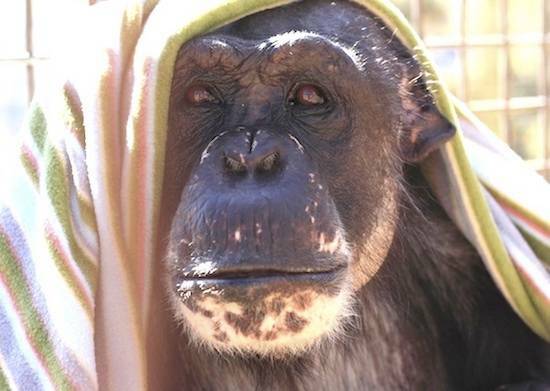 Cle Elum, Washington is a long way from equatorial Africa where Negra was born, but the support of caring donors over the last eight years has given Negra back some of the freedom of the wild that was taken from her 43 years ago. Today is the eight year anniversary of the arrival of the Cle Elum Seven chimpanzees to Chimpanzee Sanctuary Northwest! We also celebrate Negra's birthday on this day. Below is a story about Negra (we refer to her as the Queen of the sanctuary) that I hope will touch your heart the way that Negra touches hearts everyday. 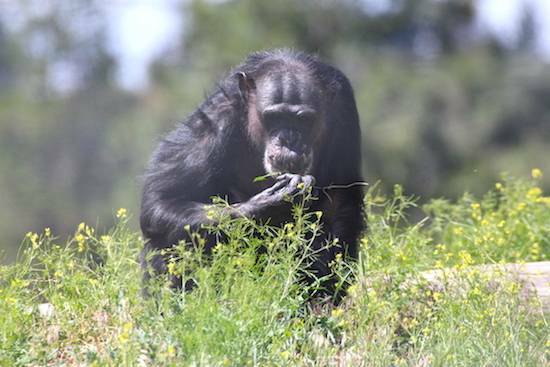 Please consider making a donation at Chimpanzee Sanctuary Northwest in honor of Negra, this story, and what sanctuary means for chimpanzees. I have thought about Negra every single day since meeting her in the basement holding cell where she lived with Annie, Burrito, Foxie, Jamie, Jody, and Missy for over a decade. I have thought about her as I read through the sparse records given to us that briefly chronicled her life that began in the forests of Africa as an infant and included over thirty years as a biomedical test subject and a mother who was never given the opportunity to raise her children. Negra is the reason I get up in the morning. Her continuing story is a daily reminder of what the mission of the sanctuary is really about–recently, even more so. The sanctuary began with modest means but big dreams. One of the biggest dreams was realized in 2011 when the door to a new two-acre enclosure called Young's Hill opened for the seven chimpanzees. Negra was the most apprehensive of the group on this day, and continued to be apprehensive of the big open expanse even after all of the other chimpanzees explored the hill day after day. 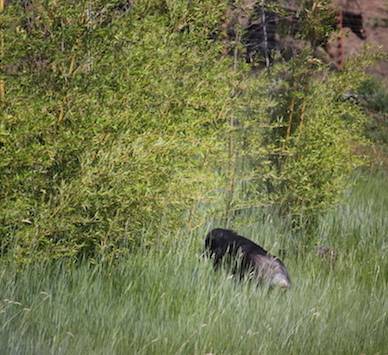 This spring, however, Negra has made incredible strides to overcome her apprehension. The other day I witnessed something that touched me more than perhaps any other moment in the last eight years. Two days ago, I was taking photos of the chimpanzees sleeping in the greenhouse when Negra climbed down from the platform and greeted me where I was standing on the other side of the fencing. She then proceeded to calmly walk out the tunnel to the hill, all by herself, and disappear into the grass. I decided to see what she was up to, so I took the camera and walked up the hill on the human side of the enclosure. I found Negra foraging for the wild edible plants close to the top of the hill. Though she's been getting gradually more comfortable outside, prior to this spring, Negra had never traveled this far away from the building. I had tears in my eyes as I watched Negra. Not only is she continuing to overcome fears and anxiety, she is becoming more of a chimpanzee by following her instincts. I have no doubt that Negra will always love the comfort of her fleece blankets inside the sanctuary building, but it is so inspiring that her world continues to open up beyond her previous comfort zone.